CCTV Camera Pros MPEG4 surveillance DVRs have the option to allow users to set the DVR to record over the oldest captured video. This enables surveillance recording to continue when your hard drive is full. For these instructions we will be using the button controls directly on the front of the DVR. The MPEG4 DVRs also allow you to configure this using the remote control that comes with the DVR. Press the Menu Button. 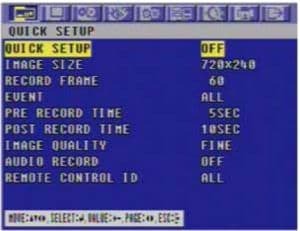 The QUICK SETUP menu appears as seen below. Press the (+) Button to set the QUICK SETUP to ON. Press the Down Button until EVENT is highlighted in yellow. Press the (+) Button until EVENT is set to MOTION. The PRE RECORD TIME and POST RECORD TIME control how long surveillance footage is recorded before and after motion detection is detected by a camera. If you want to adjust these times use the UP/DOWN and +/- buttons to adjust these times. When you are done, press the ESC Button. The EXIT menu will appear as seen below. 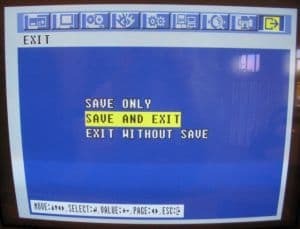 Press the Down Button until SAVE AND EXIT is highlighted. Your should now see the live camera view and motion detection recording is now enabled.